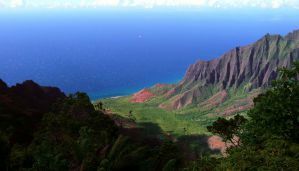 Kauai is considered to be one of the most beautiful of the Hawaiian islands, as well as one of the most beautiful in the Pacific. With international airports, plenty of dining, shopping, and attractions, stunning beaches, unique mountain scenery, and accessible state parks, it's no surprise why this island is popular with visitors from all of the U.S. and the world. Part of the attraction of the island is the range of choice in accommodation. While on vacation in a tropical paradise, why wouldn't you want to stay in a hotel that takes every advantage of the surroundings? 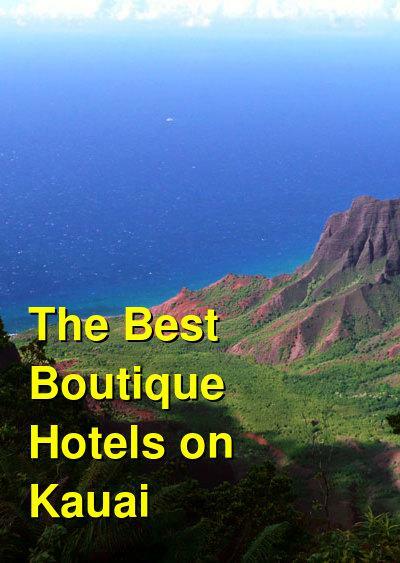 Even though there is a range of prices and choices of hotels on the island, many boutique hotels offer beautiful scenery in a world-class and friendly setting with the modern comforts of a nice hotel. Listed below are some of our favorites from a wide range of prices and levels of luxury. Every budget group is listed here, so there is something for everyone. On the beach north of Lihue, the Kauai Coast Resort is placed in a private and quite spot amongst tropical gardens. The decor is comfortable, warm, and welcoming, and couples and families will find everything they need for a great vacation. The gardens weave their way around the pool, complete with a stone waterfall, while a hot tub overlooks the beach and ocean. The atmospheric open-air restaurant offers great dining options with local ingredients, while the bar provides a more casual menu for those looking to relax by the pool. And don't miss the fire pit, either! The resort has a fitness center with spa services as well. Rooms are nicely appointed, and many are condo-style, offering kitchen amenities with a full range of appliances. Some even have lanais and laundry machines in the rooms. Every last detail of the Koa Kea was carefully designed, and the modern and luxurious rooms and public spaces are just stunningly beautiful. Located on the beach in Koloa off of Poipu Road, this resort boasts a full service spa, outdoor pool, terrific restaurant and poolside bar, and fitness center. This place also handles weddings like a charm! The gardens and pool are simply beautiful. Rooms are stylish and luxurious, offering large TVs, desks, refrigerators, and free bottled water. You can't go wrong with this place, it has to be seen to be believed. If you're looking for an inexpensive option, the Garden Island Inn near Lihue is very affordable and sits just across the road from the beach. A short drive from many attractions, shopping, and restaurants, what this hotel lacks in luxury it makes up for in location, convenience, and price. But despite the low price, the Garden Island Inn is still very nice. Rooms have a fun and festive decor (great for families), free wi-fi, cable TV, kitchenettes with microwaves and refrigerators, and daily housekeeping. The hotel grounds have a pool, a picnic area, and free parking. To the west of Hanalei Bay on the northern side of Kauai sits this charming and luxurious resort right on the beach. With ocean view rooms offering panoramic windows, a full service spa, and nearby access to the stunning state park, this resort offers a great deal of amenities. With an outdoor pool and spa tub, surrounding gardens, free parking, and a free shuttle to other nearby beaches, the staff at Hanalei Colony Resort will make sure you enjoy your stay. Rooms have lanais, fans, wi-fi, complementary toiletries, kitchens with microwaves and refrigerators, and daily housekeeping. A great affordable option for families and couples alike, the Plantation Hale Suites sits on the beach north of Lihue and is close to a number of restaurants and shops. With 3 pools and 3 spa tubs, if the beach doesn't suit you then you'll still find some recreation. The resort also offers shuffleboard, grills, on-site laundry, and a beach bar. The nicely appointed rooms have flat screen TVs with cable and video game consoles. All units are condo-style with fully stocked kitchens with all needed appliances and cutlery. In-room massages are also available. Overall, the amemities of this resort, combined with the price and the decor make this a great place to stay for all types of vacationers. At the more luxurious end of the price spectrum is the stunning St. Regis at Princeville, on the east side of Hanalei Bay on the northern side of the island. This large complex offers pretty much everything. From the striking lobby to the guest rooms, the decor is perfectly designed to give you a sense of awe, comfort, convenience, and beauty. The interior truly takes your breath away. Rooms are nicely laid out, and provide views of the gardens, ocean, or mountains, and offer large TVs, marble bathtubs, and electronically controlled windows. How can you say no to that? The infinity pool overlooks the ocean and private beach, while the lobby and on-site restaurant offer panoramic views of the water. Naturally, full spa and fitness services are offered. Another striking resort at the upper end of the price scale is the Koloa Landing at Poipu Beach. Close to shops and restaurants, this resort is a short walk from the beach, but offers an extensive and beautiful pool and spa area. In this condo-style resort, all rooms offer full kitchens with not only a full range of appliances, but also luxurious appointments such as stone counter tops. Rooms open into lanais from large sliding doorways, many of which wrap around two sides of the room and provide breathtaking views. The two outdoor pools weave through the surrounding gardens in a natural design offering a natural and romantic setting. The grounds are perfectly designed and maintained to provide that true sense of being at a dream tropical destination. Every possible convenience at this Wyndham resort has been taken care of, from the full spa to the fitness center to the bar and lounge. This place is not to be missed!